Some sudden failures usually lead to cone crusher getting stuck, seriously affect the production and reduce the service life of the equipment and components. Next, let's take a look at the three major cases that lead to cone crusher stuck. 1. The feeding is too much or the property of the feeding material doesn't conform to the requirements, resulting in cone crusher blocking and making its working current too large, thus the automatic protection device of the circuit forces the machine to stop. 2. When iron blocks or some things that cannot be broken enter into the crushing cavity, it can also result in cone crusher blocking. The second, main shaft fracture. 1. 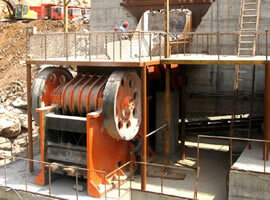 Improper use of cone crusher is one of the major reasons for main shaft fracture. For example, in order to achieve the desired discharging fineness, the operator keeps tightening the discharging mouth; Or something infrangible fall into the crushing cavity and give the main shaft a strong impact, leading to cone crusher shaft rupture and equipment plugging. 2. 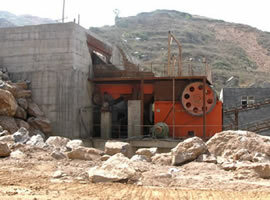 Cone crusher is in a long-term overloaded operation. Even the overload protection device cannot protect the equipment against all damages, so the main shaft is liable to fracture and leads the equipment to get stuck. The third, the moving cone and adjusting sleeve getting stuck. 1. When cone crusher is kept running overloaded, the hydraulic pressure station may lose pressure and the locking may lose efficacy, then the adjusting sleeve will rotate with the moving cone. Without timely discover and treatment, it will make the adjusting sleeve get stuck and thus result in machine halt. 2. The poor lubrication of screw thread, the seal wear of the adjusting cap and dust cap, the thread scratch of the adjusting sleeve and support sleeve, or long term of overloaded operation all can cause the adjusting sleeve getting stuck.